It is often said that Microsoft doesn’t innovate but simply copies existing ideas. To argue in opposition would be no small feat considering it doesn’t take long for anyone familiar with the tech industry to rattle off examples from Windows to the browser. However, LINQ is not one of those. LINQ was wrestled forth from the keen mind of Anders Hejlsberg—the author of Turbo Pascal and chief architect of Delphi—who joined Microsoft in 1996 after being lured out of Borland. What bothered Anders the most when he joined Microsoft was not his reported 3 million dollar signing bonus but how disconnected the existing programming models were for different domains. To communicate with databases, for example, you must know SQL and how to write stored procedures. The more they thought about the problem the more they realized different programming models were most prevalent around data query. The solution was LINQ—which stands for Language INtegrated Query. For an organization better known for its late game heroics rather than innovative ideas, LINQ sheds the stereotype by delivering a solid piece of software engineering which can query everything from arrays of object to SQL databases all from C#. I have been using LINQ to SQL for some home projects and love it. Before you think it must be a slow library abstraction consider that Joel Spolsky and the gang at StackOverflow, which gets 6 million unique visitors per month, have been running it from the beginning with no performance issues to date. To get started with LINQ goodness let’s look at a recent project I have been working on that screen scrapes grocery ads from the web and stores them in a database. 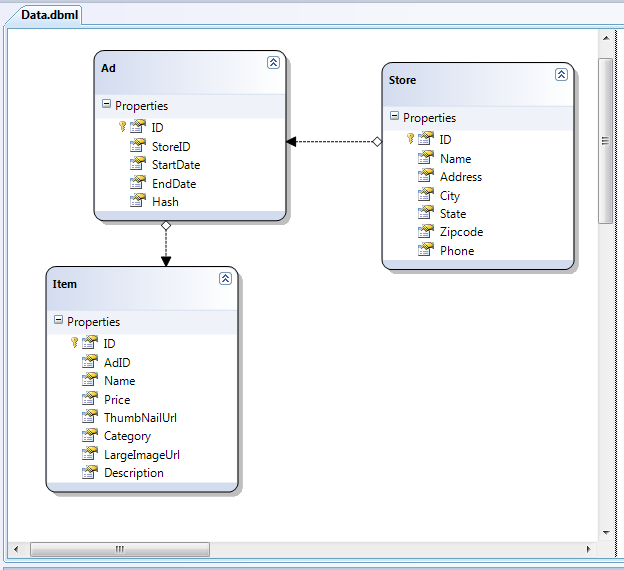 Below is my simple database schema shown from within SQL Server Management Studio 2005. From the schema each store can have many ads and each ad can have many items. Now that the database is defined, we can use the LINQ to SQL designer in Visual Studio 2008 to generate our data access classes that LINQ runs against. To do so, right click the C# project in Visual Studio and select Add>>New Item. 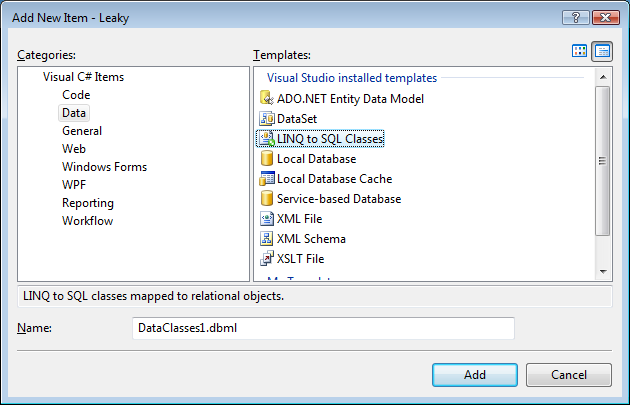 Select the Data Category and then the LINQ to SQL classes template in the right pane as shown below. A new .dbml file will be add to the project. Double clicking on it will bring up the a designer surface. 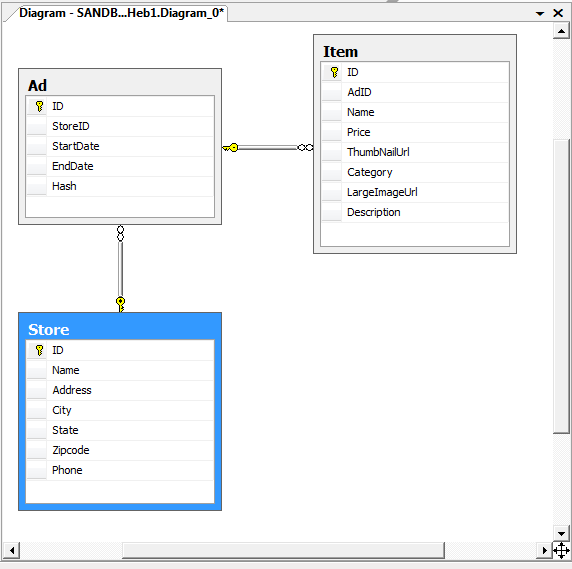 The next step is to connect to the database using Server Explorer and then drag the database tables onto the LINQ to SQL design surface. 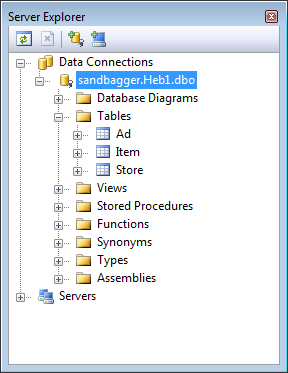 To bring up Server Explorer, click View>>Server Explorer in Visual Studio. When the Server Explorer window appears right click Data Connections and select Add Connection. Follow the wizard to connect to a database. Once this is done the Server Explorer window should look something like the screen shot below. The generated code lives in a partial class underneath the .dbml file in Solution Explorer ending in designer.cs. On closer inspection of the generated code, notice there is a class for each table. 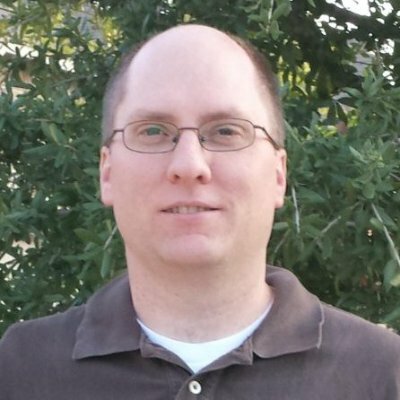 LINQ to SQL doesn’t have the ability to generate model classes that are different from the actual tables. This functionality is reserved for the ADO.NET Entity Framework which Microsoft has decided is their future data access technology. As such, LINQ to SQL’s priority has been changed to maintenance only. Even so, it’s as powerful as ADO.NET Entity framework just less flexible. Where LINQ to SQL really excels is the queries. Below is an example that gets all the items in a particular store's ads that are missing a price—this happens when the item’s price is dependent on buying another item—all from C#. This query above gives the following when I poked in the debugger. "any four (4) Lean Cuisine Entrées"
 "Bumble Bee Solid White Tuna"
 "Eckrich Meat Smoked Sausage Links or Rope"
 "H-E-B Chef Prepared Rotisserie Chicken"
 "H-E-B Fresher Lasting® Chunky Guacamole Kit"
 "H-E-B Fully Cooked® Shredded Chicken or Beef"
 "H-E-B inControl(TM) No Coding Test Strips"
 "Hebrew National Beef Franks or Knockwurst"
 "Kiolbassa Value Pack Smoked Sausage"